Relax day or night with a Solar Outdoor Umbrella! 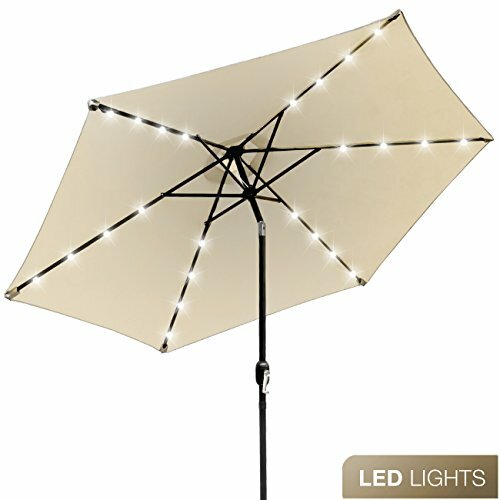 Perfect for the backyard patio, the Sorbus® Solar LED Outdoor Umbrella keeps you cool and comfortable all season. It features a solar panel that provides a glowing light lasting 6-7 hours. For sun or shade, the smooth crank lift handle opens or closes the umbrella so you can relax within seconds! Keep it fully open to shield the overhead sun or partially closed during the early morning. Just in time for sunny weather, the adjustable tilt function protects from harmful UV rays and direct sunlight exposure. Whether you're enjoying a patio brunch or reading on the lounge chair, this umbrella creates the ultimate shaded oasis. Transform your deck, patio, or poolside furniture with a vibrant umbrella, ideal for relaxing and entertaining. Enjoy stylish outdoor living! With a functional design and vibrant color, this umbrella turns even the most out-dated patio or deck into a vibrant space. Cover lounge chairs, bistro tables, cafe-style seating, and more. Mix and match the umbrella with coordinating patio cushions, pillows, and other decorative pieces for visual interest. Allow the solar light to brighten the evening during picnics, BBQ's, and other events. For large gatherings, set up several umbrellas and use the adjustable tilt feature to accommodate those who want shade verse those who prefer to bask in the sun. Innovative in design, this umbrella is UV and fade resistant to provide years of enjoyment in the shade.